In Cleveland and Columbus, you understand that you're going to have to deal with rust. With the seasonal weather and amount of salt we put on our roads during the Winter, everyone can expect a certain amount of rust on their cars. What you may not know is that you can also expect to see rust in your lawn as Summer winds down. We'll take a look at causes rust, and what you can do to fix it. 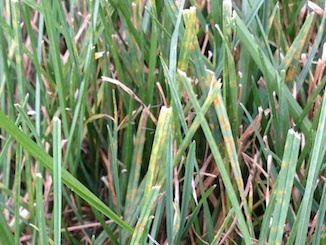 Lawn rust is a fungus that grows on bluegrass or ryegrass. This fungus is mostly cosmetic, and will not harm your lawn. It appears on your lawn as orangish powder spores directly on the blades of your grass that comes off on shoes, clothing, lawn mowers, pets and other items. Rust uses this transportation mode to spread to other areas of your lawn, furthering the progression of the fungi. How Did I Get It In My Yard? Lawn rust is a sign of slow growing, stressed lawns that are in trouble. Poor growth during the Summer is often due to a few factors such as improper watering, soil compaction, low nitrogen levels and heat stress. Rust often appears in lawns at the end of Summer or the beginning of Fall due to the warm days and cool evenings with large amounts of dew. Rust is a sure sign of a struggling lawn that needs some tender loving care. However, following these 3 tips will help alleviate rust, and prevent it in the future. Reduce Soil Compaction with a Lawn Aeration - A core aeration pulls thousands of tiny little plugs out of your lawn creating areas for nutrients and water to hit your turf's root system. The newly created areas allow for the roots to begin to grow downwards again, resulting a thicker, healthier lawn that will be rust resistant. Bag Your Lawn Trimmings - A build up of thatch can lead to thinning grass and a stressed out lawn. This, coupled with the fall weather, can lead to rust on your lawn. Keeping thatch at a minimum can prevent fungi from invading your lawn. If you already have rust, cutting your lawn without bagging it will help the fungi spread across your lawn further. Water Infrequently, Deeply AND not at Night - Long periods of water on the blades of your grass can lead to disease creeping in. The key to watering your lawn AND keeping disease away is to water infrequently, such as every other day, for long periods of time. Watering in the morning, and not at night, will also allow for sufficient drying time. Rust is Just One of the Many Summer Lawn Care Problems You'll Face. Get Our Free Guide to Learn About the Others! Fungi, insects, and other lawn care nightmares are out there right now trying to ruin your lawn! It's time that you fight back and arm yourself with the information you need to not only identify these lawn killers, but find out how you can defeat them! That's why Weed Pro Lawn Care has put together the 5 Most Common Lawn Care Problems Guide that will help you fight the good fight, and defeat any and all possible threats your lawn may face! The best part of this guide is that it's yours ABSOLUTELY FREE by clicking on the button below!